To extend the open time—Add 15% urea (available at pharmacies) or table salt by weight. For example, this recipe will extend the working time of 251 -grade glue from 1 minute to approximately 5 minutes. To improve adhesion—Replace 5% of the water by weight with white vinegar. For a softer-curing glue—Add 5% to 15% glycerin (available at pharmacies) by weight. Softer glue will better accommodate wood movement—good for situations such as applying the bonnet board to the top of a highboy. There are different grades, or gram strengthsy of hide glue. Woodworking hide glues have gram strengths from 135 to 379. The higher the number, the stronger the glue. Each grade has slightly different working properties, which comes in handy for the wide range of professional work I do. (See sidebar, above.) But even the weakest of these is plenty strong for general use: If your joinery is tight, the wood will fail before the glue does. You can also buy premixed liquid hide glue at many hardware stores and home centers. It's reversible like the homemade stuff but has a longer open time—15 to 20 minutes instead of one to five. It also has a longer shelf life. But since store-bought liquid hide glue isn't pure (it contains preservatives), it's risky to add other ingredients. This makes it less versatile than dry pearls or granules. Measure your ingredients in the proper ratios, according to the sidebar above. Then mix the dry and wet ingredients completely in a clean glass jar. Once the hide-glue granules are completely wet, let the mixture stand for one to two hours. During this time the granules will swell as they absorb water. When the granules stick together in a jellylikc form, and no free water is visible, put the jar in your heating device. I use a Hold Heet brand automatic glue pot, but you could also use a double boiler. Most glue pots maintain a temperature around 140*F. Whichever heating device you use, keep the temperature between 100"F and 140*F, so the glue heats but doesn't burn. You can test temperature with a candy thermometer. Once the glue is between 130°F and HOT, it's ready for glue-up. Because hide glue has a shorter open time than most other adhesives—one minute for standard 251 grade—glue-up goes fast. You can extend the open time by adding urea. (See sidebar, above.) But you still need to be well prepared. 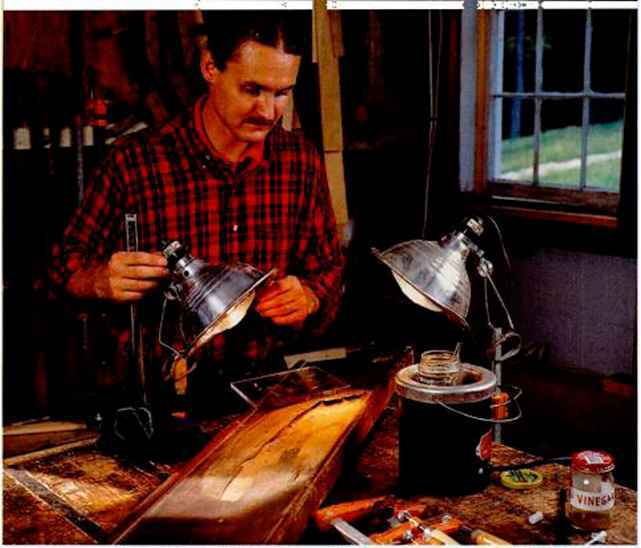 For an easier glue-up, follow this advice. Always do a dry assembly First. Look carefully at the fit of your joints; unlike epoxy, hide glue can't compensate for sloppy joinery. Consider which clamps you'll need, and lay them out prior to glue-up. Hide glue has a strong initial tack. Important ingredients. 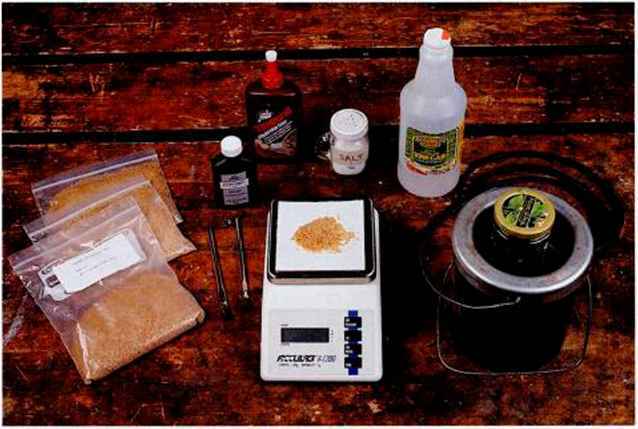 Shown clockwise from left: hide-glue granules, glycerin, premixed liquid hide glue, table salt, distilled white vinegar, glue pot and lidded glass jar, metric scale, and brushes. Warming up. Hide glue will hold better if the wood isn't cold. If your shop is chilly, move the wood to a warmer spot for a few hours before glue-up. Or use heat lamps, as shown here. cral friends available to help you get the piece clamped together quickly. Brush the glue onto both joint surfaces as shown in the photo at left below. I like to have some squeeze-out; that way, I know the joint is saturated. It's easy to clean up, as I'll discuss below. Keep the glue jar covered when you're not actually dipping into it. If the glue is left uncovered, the water will evaporate, affecting the viscosity and setting time. It's easiest to clean up squeeze-out while it's still wet, using an artists' palette knife (available at art supply stores) or a damp rag. (See photo, below right.) But you can remove dried glue by sanding or scraping, or by scrubbing it gently with a lightly dampened rag. Don't be too concerned if a tiny bit of glue remains. Hide glue is stainable; in fact, 18th-century craftsmen used it as a pore filler for this reason.